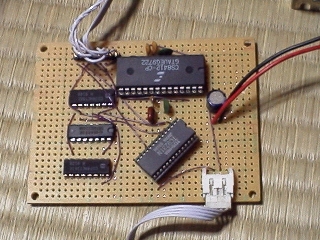 This page describes about a modification of ES1370 based sound card for support of Optical Digital I/O. 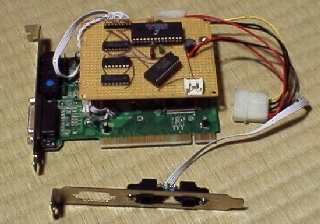 I modified my sound card in Summer 1998. I made a recording software for modified AudioPCI !! For that reason, I made a recording software that customized for AudioPCI's mpeg input. This software can record for long time, and to separate file according to silent parts. If you want to use this software, use this (AudioPciRecE.exe 29,696bytes). This program runs under Windows9x. cannot run under NT. command line don't care order of options. don't separate a option by space. number of files please don't make over 1,000 files in same folder. I/O access This software accesses I/O address 0xe000(default) at first. Therefore, if you don't use AudioPCI, attend to this issue. or PC maybe hang-up. 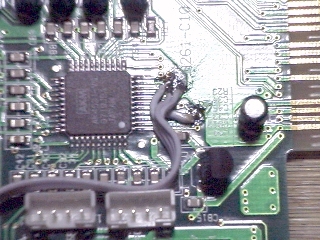 S/PDIF for AudioPCI English http://www.uta.fi/~helin/audiopci.html using CS8412 and Debug command.